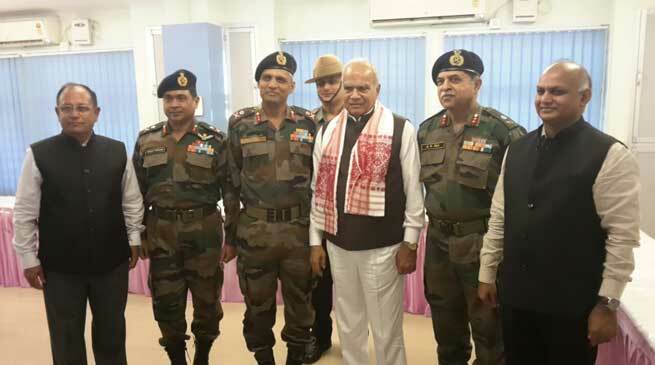 Today the 46th Annual State Managing Committee for management of Armed Forces Flag Day Fund was at held at Rajya Sainik Kalyan Board Office at Lacchit Nagar, Guwahati under the able guidance and Chairmanship of the Hon’ble Governor of Assam, Mr Banwari Lal Purohit. The meeting was attended by the Chief Secretary of Assam Mr VK Pipersenia, GOC 51 Sub Area Maj Gen AK Jha, Chief of Staff Gajraj Corps Maj Gen K Ravi Prasad, Commodore KC Choudhury, VSM(Retd) Director Rajya Sainik Board, Assam and a large number of Senior Armed Forces and State administration officials. The meeting was extremely fruitful and a number of decisions were made towards enhancement of welfare of ex-serviceman, Veer Naris and dependents of ex-serviceman. In addition to other issues discussed, deliberations were done for generation and utilisation of Armed Forces Flag Day Fund, War Memorials in the state, empanelment of additional hospitals under the Ex-serviceman Contributory Health Scheme, employment assistance for rehabilitation of ex-serviceman, Veer Naris and dependent of ex-serviceman. It is pertinent to mention that Since 1949, 7th December is observed as the Armed Forces Flag Day throughout the country to honor the martyrs and the men in uniform who valiantly fought on our borders to safeguard the country’s honor. There cannot be a nobler cause than laying down ones life for the country. At the same time, our admiration for the martyrs should not mean that we have little time for the living heroes who were wounded while doing their duty towards their motherland or their widows and children whom they left behind to fend for themselves. On this day, December 07, we observe a two minutes silence at 11am as a mark of respect to honor the martyrs from the defence services and also to bring to the forefront our obligations towards disabled comrades, widows and dependents of the martyrs and those valiant soldiers. A concerted effort is made on this day to raise collections from the public. The significance of the Day is brought home through electronic and print media. In some places, Armed Forces formations and units also arrange variety shows, carnivals, dramas and other entertainment programmes. Token Flags and Car Stickers in red, deep blue and light colours, representing the three Services are distributed to the public throughout the country by the Kendriya Sainik Board. The Armed Forces Flag Day celebration strengthens the cultural bond among the people of India and the staffs of armed forces. This celebration plays a great role in enhancing the welfare of the serving personnel of Indian armed forces. The brief history of the Armed Forces Flag Day is -The First World War, which is celebrated every year as an Armistice Day on 11th of November, was named as Poppy Day because the souvenirs of poppies were operated to benefit the ex army men as well as their relatives. But this day was incompatible for freedom of the country. So, after getting the freedom from British authority, the Indian Government had decided to pay attention towards the army men and their relatives. The Ministry of Defence had decided under the special commission of 28th of August 28 in 1949 that a Flag Day would be celebrated annually on 7th of December to collect fund from the common public by selling the India flags for the well-being of the staff of armed forces. Army men in India perform their duty for the safety and security of the Indian people so it is also the duty of common people towards the army men who are ready to sacrifice their lives in the battle.